Bozita Feline Indoor and Sterilised is a complete, balanced cat food for cats which stay inside, are elderly or have been sterilised. It has been specially formulated to meet the nutritional needs of indoors and sterilised cats which are different to those cats which roam outside. Sterilised cats have an altered hormone household and often have a tendency to overweight. Bozita Feline Indoor and Sterilised is made with lots of delicious chicken meat, which even the choosiest cat enjoys. It is easy to digest and the cellulose fibres may help to reduce hairball formation. MacroGard is a natural Β-glucan which can help to strengthen your cat's immune system. Bozita Feline Indoor and Sterilised is a balanced complete food for cats with low activity levels or those which have been sterilised. Bozita Feline Indoor and Sterilised: For adult indoors cats with normal or low activity levels and those which have been sterilised Suitable for senior cats Complete cat food Gives your cat the appropriate amount energy it needs for its leΒ active life style With cellulose fibres to reduce hairball formation With delicious, easy to digest chicken Balanced nutrients. With MacroGard, antioxidants and vitamins for a healthy immune system Swedish quality: Made in Sweden with premium ingredients and under strict quality control Bozita Feline Indoor and Sterilised cat food has many functional advantages: MacroGard a natural carbohydrate food additive made from yeast stimulates and strengthens your cat's natural defences in all stages of its life Chicken - fresh, delicious meat that's enjoyed by all cats Optimum balance of minerals to keep kidneys and urinary tract healthy. L-carnitine helps to burn fat and may encourage a healthy weight Sweden – a country of breathtaking beauty and untouched nature which provides the best poΒible basis for fresh, healthy and high-quality ingredients. This love of nature is part of the philosophy behind every pack of Bozita Feline cat food. Bozita is produced in the historical province of VästergÖtland, a place which is very dear to all who love the countryside. 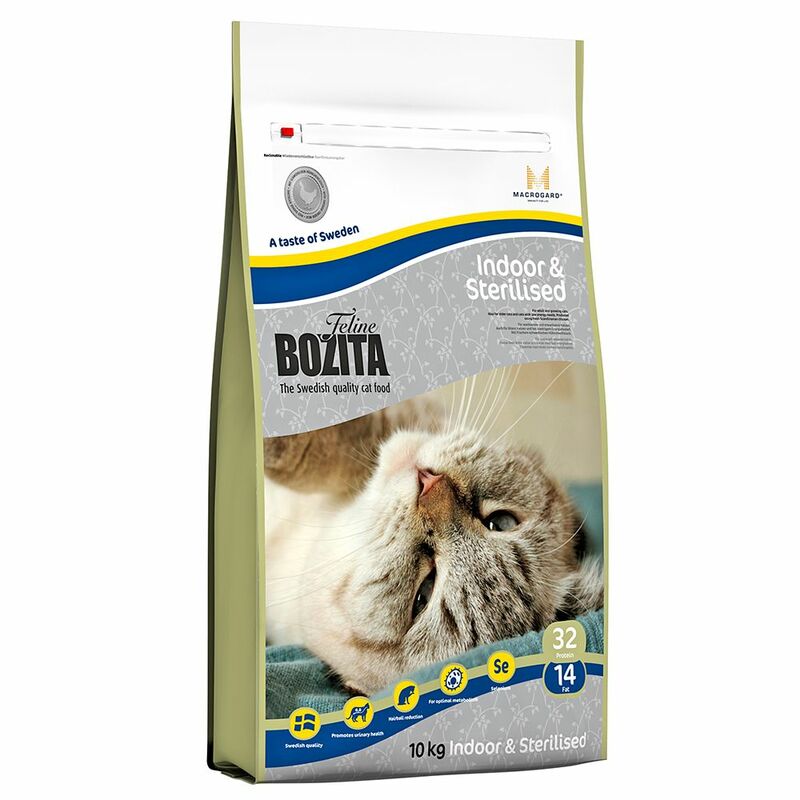 All Bozita Feline varieties are made from top-quality meat mixed with healthy bran and grain. And each variety is of the same high quality, using only meat from animals which have been raised in the Swedish countryside in humane, species appropriate conditions. All ingredients used are of high, human-grade quality. Bozita Quality - a piece of Sweden: Ingredients exclusively of the highest quality Made from meat of human-grade quality Using fresh meat in the manufacturing proceΒ not only increases digestibility but also ensures high palatability and acceptance All ingredients are free from growth hormones (Lantmännen Doggy AB policy) No artificial flavour enhancers or colourings No artificial preservatives Use of carcaΒ meal in feeding and food products has been prohibited since 1985 No animal testing has taken place as part of this production.